Welcome to visit jtfurnace dot com. 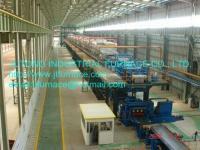 Coutinuous Annealing and Pickling Line is for continuous annealing and pickling of the steel strip etc. The heating way may be by electricity, gas, fuel oil. Advantages: 1 Intelligent heating power stepless adjustment, annealing temperature uniformity 2 Strip steel speed tension control drive, high straightness 3 Uniform hardness, bright color, good surface quality 4 Stable organization and performance 5 Short Annealing period, high productivity 6 Uses the shallow ridge turbulent flow acid pickling technology 7 Acid tank cover and tank is sealed, to reduce acid fog overflow. 8 Acid: H2SO4, HNO3, HCL Detailed product specifications, please email to us jtfurnace at hotmail dot com. Our company is specialized exporter, manufacturer and supplier of Pickling Line, China in china.